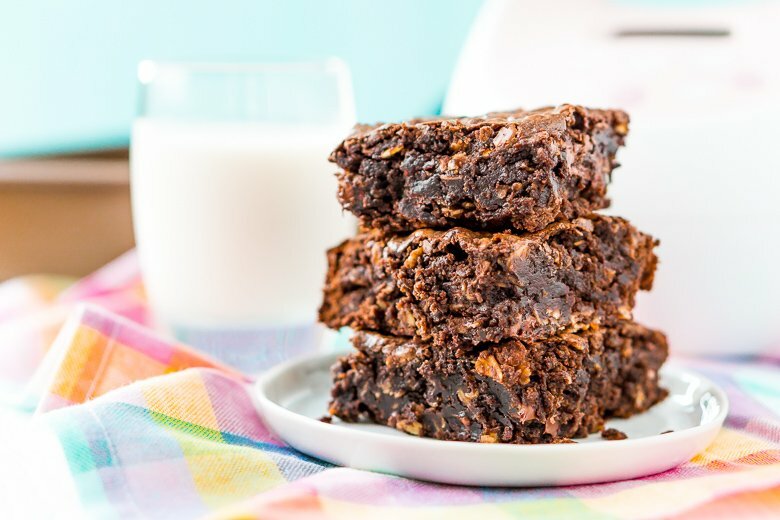 Lactation Brownies are an easy dessert that helps increase milk production with added ingredients like coconut milk, Brewer’s yeast, and oatmeal! I’m going to start off by saying that Lactation Brownies aren’t something I ever dreamed I’d be putting on my blog. But here we are and I’m not sorry. 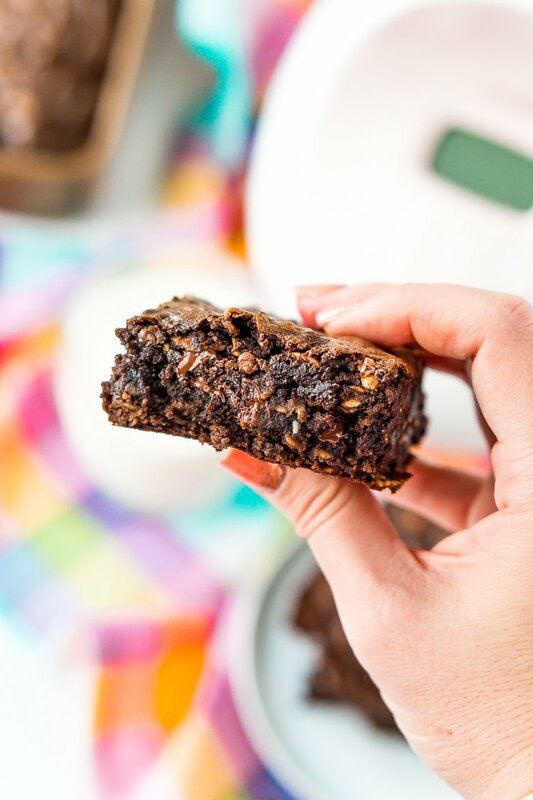 Thanks to a handful of extra ingredients, these fudgy Lactation Brownies are not only delicious but can result in increased milk supply. JUST TAKE ME TO THE LACTATION BROWNIES RECIPE ALREADY! 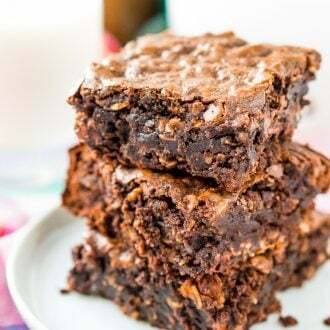 If you’d rather skip my (very helpful, I think) tips and tricks, essential cooking info, and similar recipe ideas – and get straight to this deliciously easy Best Ever LACTATION BROWNIES Recipe – simply scroll to the bottom of the page where you can find the printable recipe card. Let me say that I am not a medical professional and if you have serious concerns about your milk supply, please seek out a lactation consultant to make sure there isn’t a larger issue. Also, please note that lactation treats or food of any kinds have not been scientifically proven to increase supply. However, since I started eating 1 brownie per day, along with my oatmeal in the morning (this is the kind I eat) and a blue Gatorade during the day, my milk production has doubled. It started going up when I was eating my lactation cookies, but these brownies really pack a punch. Maybe it’s a placebo effect… but I’m not complaining because in my case it has worked and I get brownies! In this case, they’re a box mix that’s been souped-up with a few additional ingredients that have been said to help increase a mother’s milk supply. If you’re looking to increase your supply, lactation brownies could be a good option to try and do so. But I recommend speaking with a lactation consultant as well to make sure there isn’t a large issue. In my case, I’m exclusively pumping so I’m able to measure how much milk I’m producing each day, unlike a mother who primarily nurses. However, I don’t want to be attached to the pump forever, some days it feels like my life revolves around it. So in my case, my goal was to create an oversupply to make a large freezer stash so I can stop pumping after a few months but still provide my daughter with breastmilk for several months after that. 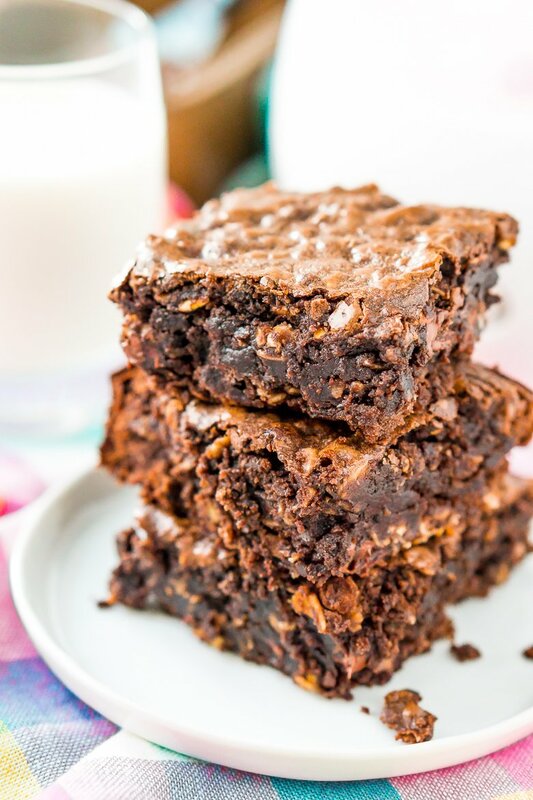 These lactation brownies are super easy to make and they are often referred to as emergency lactation brownies because they’re made from a box mix. You’ll begin with the box mix itself and then whatever amount of vegetable oil is called for and either 1 or 2 eggs depending on whether or not you want a fudgy or cake-like consistency. You’ll also add a touch of vanilla and some chocolate chips if there aren’t any already in the box mix. Coconut Milk – Replace any called for milk or water on the box with a 1/2 cup of coconut milk (in the carton, not the can). Coconut milk is very hydrating and will assist with milk production. Old Fashioned Oatmeal – A lot of lactation consultants recommend adding oatmeal to your diet, usually as a breakfast, but it doesn’t hurt to sneak it into your dessert either. Brewer’s Yeast – This stuff has tons of health benefits from nutritional value to helping fightthe baby blues, read about them on Verywell Family! Ground Flaxseed – Flaxseed has phytoestrogens that can influence breast milk production. Collagen Peptides – Okay, so this product isn’t a milk supply booster, it’s more just another beneficial product for new moms. Collagen peptides contain the same amino acids as gelatin which is identical to the protein found in skin, nails, hair, bones, cartilage, and joints. I recommend taking this to help with postpartum hair loss. How Fast Do Lactation Brownies Work? In my case, I started noticing an increase in supply the next day, some say they work soon and other it takes a little longer. Can You Freeze Lactation Brownies? You sure can! Feel free to whip up a batch and put half in the freezer. Enjoy the first half for the next few days and when you run out, pull the others out and let them thaw on the counter before enjoying. If you’re making these in advance, say before the baby even arrives, just so it’s one last thing you need to worry about, bake the brownies and let them cool. Slice and wrap the brownies individually in plastic wrap then put in a large freezer bag for up to 3 months. 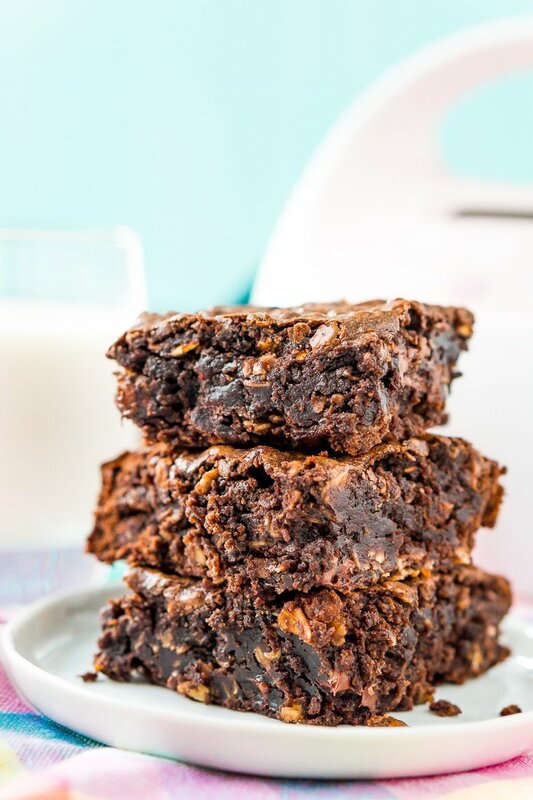 So there you have it, an easy recipe for lactation brownies that will hopefully help boost your milk supply and be a welcome treat during the trying (but beautiful) baby stage. Also, you burn 20 calories for every ounce of milk you express, so you can feel a little less guilty about indulging! 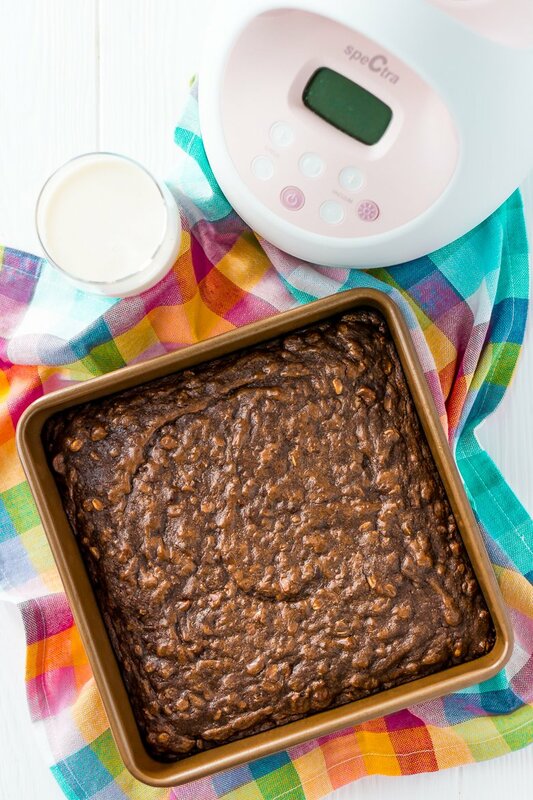 Pin this Lactation Brownies Recipe for Later! 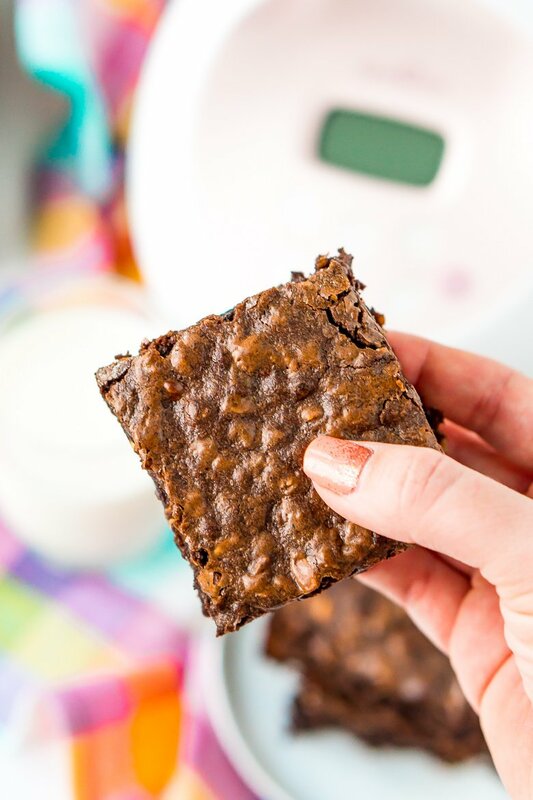 Lactation Brownies are an easy dessert that helps increase milk production with added ingredients like coconut milk, Brewer's yeast, and oatmeal! In a large mixing bowl, mix together all ingredients until fully combined. Pour brownie batter into a 9x9-inch baking dish and bake according to package directions. Choose whatever boxed brownie mix you'd like. I've made this recipe with 5 different varieties, all with similar results. Coconut milk is the kind in the carton in the refrigerated section of the grocery store, not the canned kind. You can use 2 eggs instead of 1 if you prefer more cake-like brownies. Chocolate chips can be omitted in box mixes that already have them in it. Hey! Thanks for the recipe, I’m excited to try! Do you know if Almond Milk could be substituted for the coconut milk? I dislike coconut and read almonds and almond milk are also good for Lactation 🙂 thanks in advance! Hi, I can’t wait to try these! 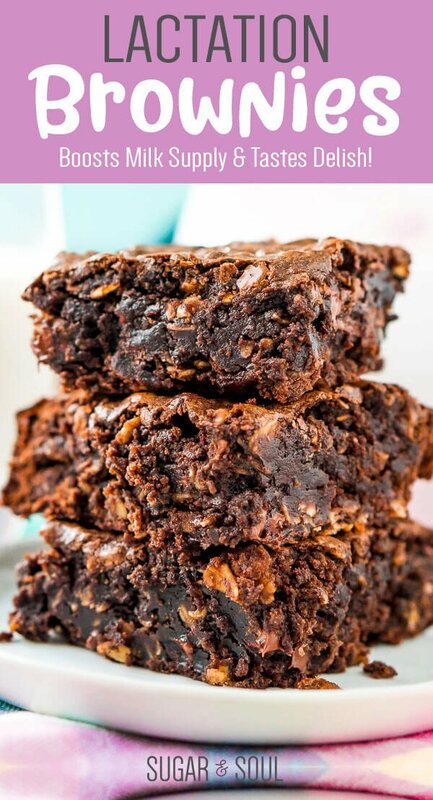 How many brownies do you need to eat daily to see an increase in supply? Hi Dawn, I cut the 9×9 pan of brownies into 18 brownies and had two of those per day. You could cut them into 9 and do just 1 brownie if that’s easier for you. I just liked to have a treat around lunchtime and in the evening. I found that was enough to give me a boost, but more than that could mean a larger boost, but it means more calories too so you just have to figure out what works for you. Great, thank you! And also, I made a batch of these already and they taste SO good! So glad you are enjoying them! I’ll be posting my Lactation Cookies recipe next week! Hi! I’m making these for a friend. She’s not a new mom, so if I omit the collagen peptides, will it effect the recipe? What would happen if I used coconut milk in a can instead of a carton? It’s all we have. Thank you! Hi Eli, it should still work fine, just make sure to mix the canned stuff up before measuring since it tends to separate when it sits for so long.